Frozen Inferno Slots has a generous 40 paylines, 2 exciting Wilds and FREE spins! Decide if you’re feeling hot or cold, then spin to win! 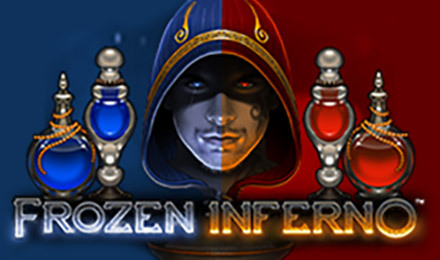 Frozen Inferno Slots has 40 paylines, a hot and cold theme, generous bonuses and big wins! Before you hit SPIN, choose either the ice or fire game mode. In the ice game, look out for the Wild, which can turn into a Frozen Wild, and if you’re playing the fire game, your Wild can turn into a Roving Wild. And last but not least, when you amass 5 Wilds in Frozen Inferno, your FREE Spins Bonus will begin!